The Equinix Cloud Exchange Fabric (ECX Fabric) is now providing connections between 37 markets across five continents. ECX Fabric is an on-demand, SDN-enabled interconnection service that enables customers to privately interconnect clouds, networks and services to global data centers at their digital edge. The expanded connectivity allows customers to connect to clouds in other regions, between the Americas, Europe and Asia-Pacific. Additionally, customers can use the expanded ECX Fabric service as a primary connection between Equinix International Business Exchange (IBX®) data centers or as a complement to their existing networks. ECX Fabric also enables customers to streamline their access to the world's largest cloud providers such as Amazon Web Services, Microsoft Azure, Oracle Cloud Infrastructure and Google Cloud on Platform Equinix. Equinix said that more than 1,400 customers are currently using ECX Fabric and have established more than 14,900 active virtual connections to ECX Fabric. Karl Strohmeyer, currently President, Americas, will begin serving as Chief Customer and Revenue Officer, overseeing the company's overall go-to-market strategy. Sara Baack, who currently serves as Chief Marketing Officer, will take on the role of Chief Product Officer, leading Product Marketing, Management, Development and Engineering across core colocation and interconnection offerings, as well as overseeing the company's edge services portfolio. Eric Schwartz, currently President, EMEA, will begin serving as Chief Strategy and Development Officer, overseeing Corporate Strategy, Corporate Development, Business Development, Real Estate, Capital Planning and the company's hyperscale initiatives. Charles Meyers, President and CEO, Equinix, stated: "As we continue to enhance the value of our global platform and serve an increasingly strategic role in the digital transformation of our customers, these changes to our organization will enable us to advance our leadership as the trusted center of a cloud-first world. Karl, Sara and Eric have a combined 24 years in executive roles at Equinix, and I am supremely confident in their understanding of our customers as they continue to embrace and execute their transformation to digital business, and the unique opportunity that our organization has to serve them." 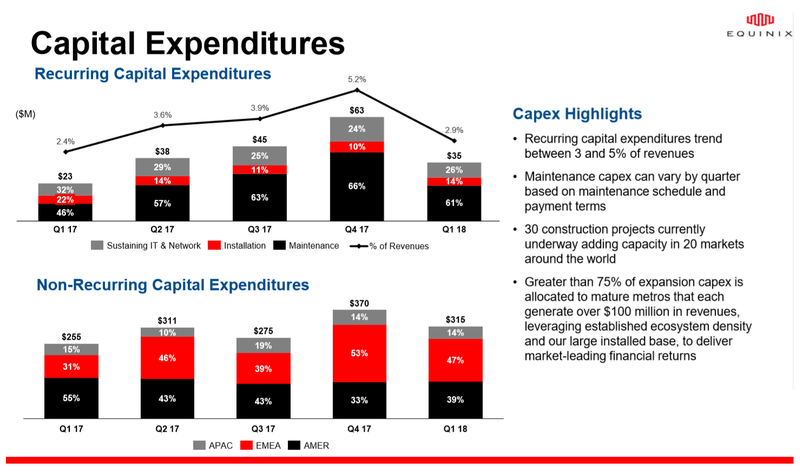 Equinix reported 2018 annual revenues of $5.072 billion, an increase of 16% year-over-year; 9% growth on a normalized and constant currency basis. Net income amounted to $365 million, a 57% increase over the previous year. Strong bookings across all three regions (Americas, EMEA and Asia-Pacific) in Q4 with record EMEA bookings, and the second-best booking performance to date in the Americas and Asia-Pacific regions. Equinix bookings this quarter spanned across more than 3,000 customers, with a quarter of those customers buying across multiple metros. Enterprises continue to leverage Equinix's highly distributed and cloud-enabled global platform to locate their infrastructure closer to the interconnected digital edge. In Q4, 60% of total recurring revenues came from customers deployed across all three regions, and 86% of total recurring revenues came from customers deployed across multiple metros. 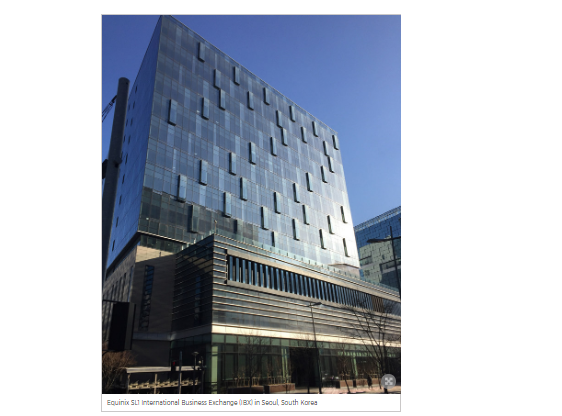 Equinix opened a new International Business Exchange data center in Seoul. The carrier-neutral data center, called SL1, will provide more than 18,000 square feet (approximately 1,680 square meters) of colocation space, offering an initial capacity of 550 cabinets in the first phase, and is scheduled to open in Q3 2019. The facility is located at Sangam, known as Digital Media City, near Seoul's central business district. Equinix notes that it has invested more than $800 million over the past three years to organically build and expand its presence in the Asia-Pacific region. Equinix now has 200 IBX data centers across 52 markets and 24 countries, providing data center and interconnection services for more than 9,800 businesses. Equinix currently has 40 IBX data centers across 12 markets in Asia-Pacific. Equinix will invest US$85 million to build its fourth International Business Exchange (IBX) data center in Singapore, called SG4. The new seven-story data center is scheduled to open in Q4 2019, offering an initial capacity of more than 45,400 square feet (approximately 4,220 square meters) of colocation space and 1,400 cabinets in the first phase. Equinix said the facility will accommodate more than 4,000 cabinets at full build out, with a total colocation space of more than 132,180 square feet (approximately 12,280 square meters). The new SG4 will be strategically situated at the East of Singapore in one of the country's five data center clusters — Tai Seng Industrial Estate — providing location diversity from the three existing Equinix IBX data centers in Singapore. SG4 will also provide software-defined interconnection through Equinix Cloud Exchange Fabric (ECX Fabric) to more than 1,300 businesses including some of the largest cloud service providers (CSP) among them Alibaba Cloud, Amazon Web Services (AWS), Google Cloud Platform, Microsoft Azure, Oracle Cloud and Tencent Cloud. Currently, the three Equinix IBX data centers in Singapore comprise more than 445,000 square feet (41,400 square meters) of colocation space. 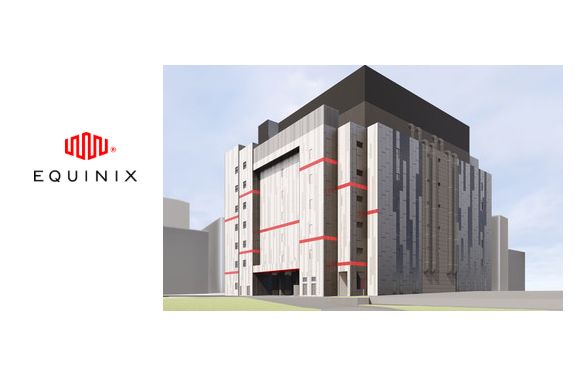 In Q3 2018, Equinix announced the completion of an expansion of the SG3 IBX data center in Singapore that nearly doubled the size of the facility. MEF18 Proof of Concept, 29 - 31 Oct - Fulfillment and Activation of an Intercontinental MEF 3.0 Service Spanning Four Operators. PoC Participants: Tata Communications, Sparkle, Equinix, Liquid Telecom, ECI, Amartus, and Spirent. This PoC won the MEF 3.0 Implementation Project 2018 Award in 2018. Speaker: Vova Kamenker, Technical Presales Engineer, ECI. The main goal of this PoC is to demonstrate the automated & assured orchestration of MEF services across multiple operators’ domains on production networks. The PoC demonstrates the ordering and fulfillment of a complex service comprising connectivity services and VNFs. The showcase demonstrates the feasibility of using NFV-based Service Activation and Testing solutions for MEF 3.0 Carrier Ethernet services via LSO Presto APIs. As part of this PoC, several LSO:SOF implementations are used (e.g. ONAP, proprietary) in a single MEF 3.0 Carrier Ethernet service deployment interacting via LSO Sonata and LSO Interlude APIs. Use Case: A Tata Communications customer uses the Tata service portal to order a service to Tata cloud service. However, one of the customer’s sites is not located on a Tata network and hence this request is sent to Tata’s operator partners for serviceability checks. This PoC is part of a multi-year MEF 3.0 Implementation project that provides feedback to the MEF technical committees on a range of aspects of LSO orchestration of complex services comprising connectivity and virtual entities (SDN + NFV) across multiple operator domains. Equinix will build a new International Business Exchange (IBX) data center at its London Slough campus. The LD7 data center will cost approximately $120M (£90M) and scheduled to open Q2 2019. The facility will be built to LEED gold certified standards. This will bring the company's UK portfolio to 12 IBXs. Equinix said it remains confident in the future of London as Europe's major financial hub and one of the world's greatest commercial cities, regardless of the outcome of the ongoing negotiations around the UK's departure from the European Union. 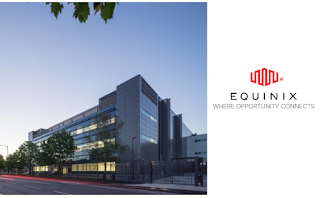 The new $120M (£90M GBP) data center forms part of a total $387M (£295M GBP) investment in the UK's digital economy from Equinix throughout 2018/19. Russell Poole, managing director UK, Equinix, states: "London is one of the most important connection points in the world and we expect this growth to continue as the city continues to play a crucial role in powering the global digital economy. LD7 will be one of the most technologically advanced colocation data centers in the world and will be a major addition to our thriving London Slough campus. This latest data center will also act as a sustainability benchmark for future data centers – something we are very passionate about." 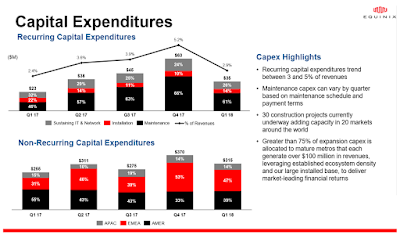 Equinix reported that interconnection revenues growth continued to outpace colocation revenue growth in Q3, reflecting what it calls a movement towards "Interconnection Oriented Architecture" strategies and the adoption of hybrid multicloud as the preferred IT deployment model. 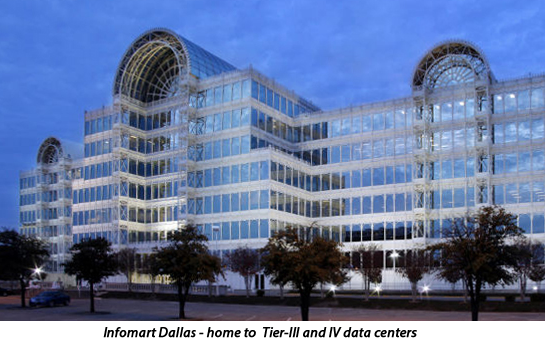 Interconnection revenues grew 2.5% over Q2, while colocation revenues grew 1.8%. On an annual basis, Equinix's interconnection revenue grew 12.8%, while colocation revenue grew 10.3%. 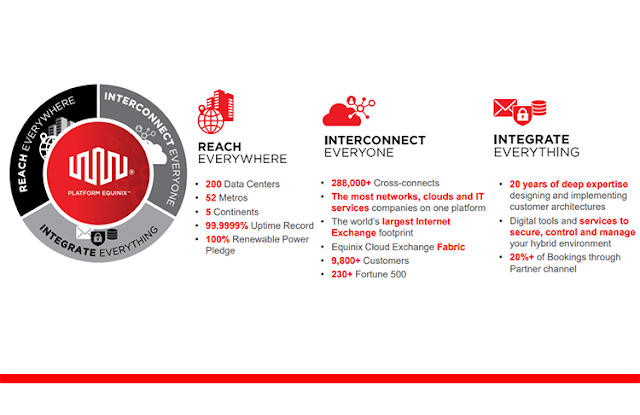 Cross connects between customers increased to more than 294,000, and the Equinix Cloud Exchange Fabric platform now serves more than 1,300 customers. In Q3, Equinix completed nine expansion projects in eight markets including Culpeper, Frankfurt, Houston, Melbourne, Miami, Rio de Janeiro, Singapore and two in São Paulo. The company has 30 expansion projects currently underway across 21 markets in all three regions, including seven newly announced expansions in Frankfurt, Helsinki, London, Madrid, Osaka, Seattle and Warsaw. In Q3, more than 59% of revenues came from customers deployed across all three regions, and 85% came from customers deployed across multiple metros. 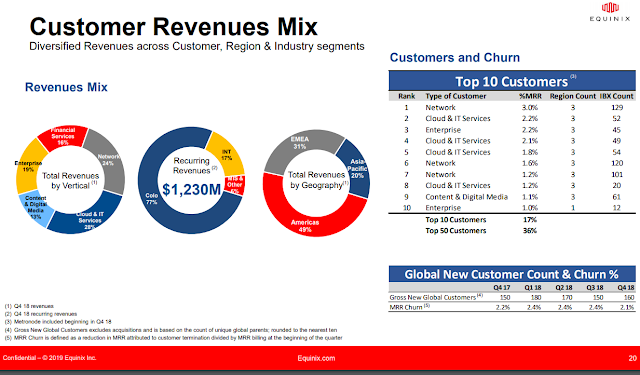 Overall for Q3, Equinix reported revenue of $1.284 billion, a 2% increase over the previous quarter. Net income amounted to $125 million, an 85% increase over the previous quarter, including $9 million of integration costs for acquisitions. Charles Meyers, who was appointed CEO of Equinix in September, stated "I am extremely proud of our track record of success in my eight years as a member of the leadership team, and that track record continues this quarter with our 63rd quarter of consecutive revenue growth. Since 2010, we have more than quadrupled the size of our business, and we have invested $22 billion in capital to build the world's leading interconnection platform, positioning us as the trusted center of a cloud-first world. As CEO I will build on this strong foundation, and we will remain focused on extending our core sources of differentiation: superior global reach; market-leading network and cloud density; the industry's most comprehensive interconnection portfolio; scaled digital ecosystems; and an unwavering commitment to service excellence." 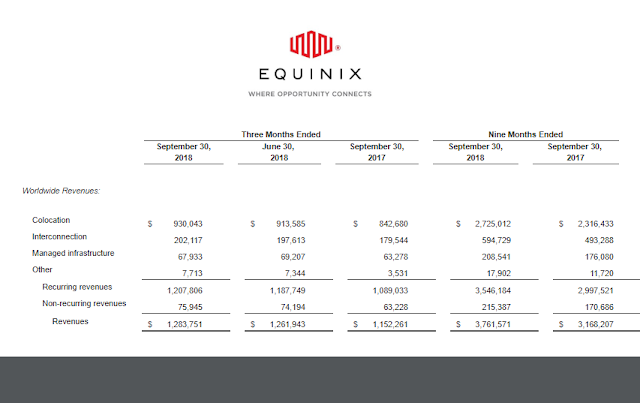 Equinix reported quarterly revenue of $1.262 billion, up 18% year-over-year or up 9% yoy on a normalized and constant currency basis. Net income amounted to $68 million and adjusted EBITDA was $604 million, with a 48% adjusted EBITDA margin. Peter Van Camp, Executive Chairman and Interim CEO and President, Equinix: “Equinix delivered another strong quarter with record bookings across all three regions and virtually all key operating metrics showing solid momentum in our go-to-market engine and interconnection strategy. Our unique global platform of 200 data centers, and the customer ecosystems within them, remain at the heart of our strategy, as evidenced by strong cross-regional sales and healthy interconnection activity in Q2." 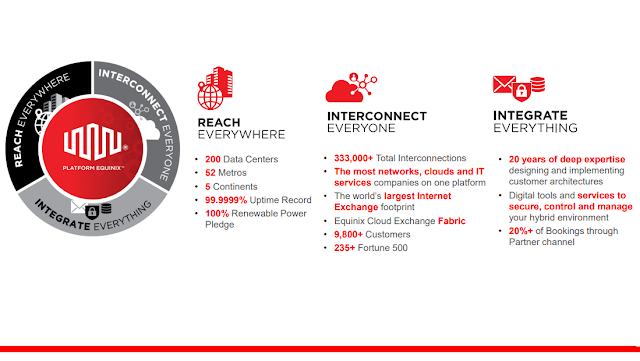 The Equinix Cloud Exchange Fabric platform now serves more than 1,200 customers. Customer deployments across multiple metros increased to 85% of total recurring revenue. Equinix and Oman Telecommunications Company (Omantel) announced a joint venture to deliver data center and interconnection services to customers in the Middle East through the development of a new network-dense data center that will be located in Barka, near Muscat, the capital of Oman. Equinix and Omantel will both fund equity contributions in an amount of US$10 million for the joint venture representing a 50% shareholding each, and additional funds will be raised through debt financing assumed by the joint venture company. Equinix said its planned IBX data center in Oman will benefit from connectivity to strategic cable landing stations (CLS) and subsea cable systems that terminate directly inside the facility. Equinix will host the Vocus-owned Australia Singapore Cable (ASC) in its International Business ExchangeTM (IBX) data centers in Singapore and across six metros in Australia, including the Cable Landing Station (CLS) in Perth and points of presence (PoP) in Sydney and Melbourne already announced. The Equinix points of presence will provide the ASC cable will onward connecting to more than 155 networks across the region. 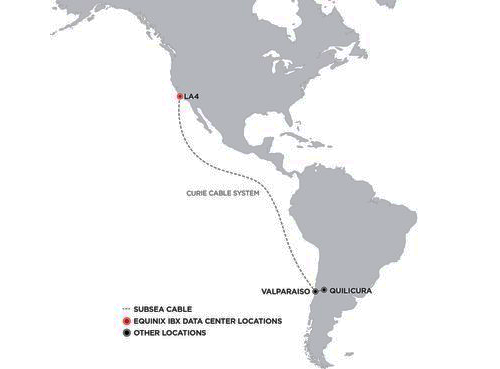 Equinix noted that it is currently engaged with multiple submarine cable projects, including: SSCN (California - Sydney); AEConnect-1 (New York - London); Hibernia Express (New York - London); C-Lion1 (Germany - Finland); Trident (Australia - Indonesia - Singapore); Globenet (Florida - Brazil); Asia Pacific Gateway (China - Hong Kong - Japan - South Korea - Malaysia - Taiwan - Thailand - Vietnam - Singapore); Hawaiki Cable (U.S. – Australia – New Zealand); Gulf Bridge International Cable System (Middle East - Europe); FASTER (U.S. West Coast - Japan); Seabras-1 (New York - Sao Paulo); Monet (Florida - Brazil), Eastern Light (Nordic region), MAREA (U.S. East Coast – Spain), BRUSA (U.S. East Coast – Brazil) and ASC (Australia – Singapore). "We are delighted that Equinix is expanding the reach and availability of the ASC cable by connecting it directly into nine of their sites across Australia and Singapore. The Vocus terrestrial network has vast reach throughout Australia, New Zealand and now into Asia. Combining the extensive interconnection ecosystems in Equinix, with the far-reaching Vocus network, we will provide customers with easy and low-cost access to all of their partners from Singapore to major metropolitan cities in Australia," stated Michael Simmons, Interim CEO of Vocus. Equinix and Telxius, Telefónica's infrastructure subsidiary, are collaborating on U.S. facilities and services for the next-generation cable landing station architecture for the MAREA and BRUSA cable systems, both of which terminate at a cable landing station in Virginia Beach, Virginia. The next-generation cable landing station architecture will extend the backhaul capacity into Equinix DC2 International Business Exchange (IBX) data center, simplifying network design and providing access to a dense, rich ecosystem of networks, clouds and IT service providers. Equinix customers will have direct access to the MAREA and BRUSA cable systems via a simple cross connect from any IBX data center. The 6,600 km MAREA subsea cable, which was jointly funded by Microsoft and Facebook, is the highest capacity subsea cable system built across the Atlantic, consisting of eight fiber pairs with an initial estimated design capacity of 160 Tbps. 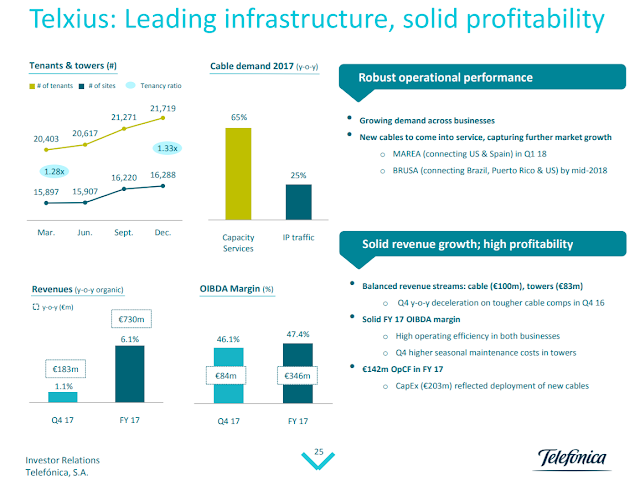 Telxius is responsible for the operation of the cable and leverages its IP, capacity, colocation and security services through it. Telxius is also building BRUSA, a new subsea cable spanning 10,900 km linking Rio de Janeiro and Fortaleza, Brazil, with San Juan, Puerto Rico, and Virginia Beach, VA. BRUSA, which is slated for completion by mid-2018, also features eight fiber pairs. 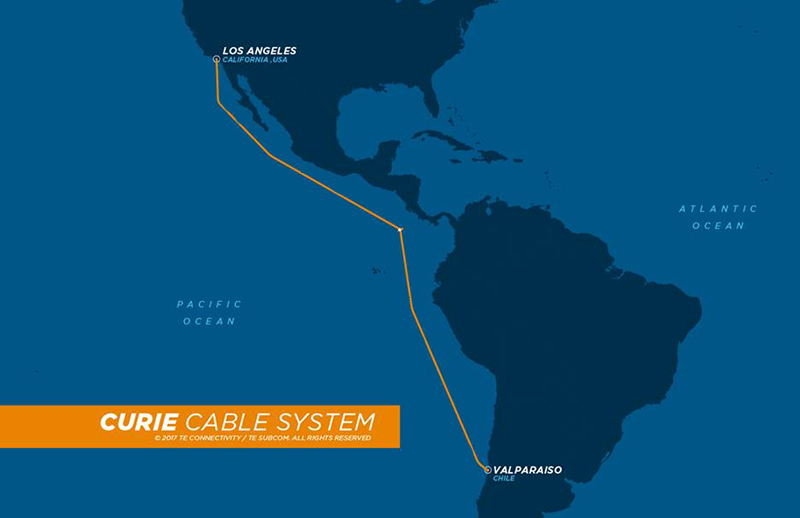 "We're partnering on new cable landing station projects that give our customers improved access to the expanding global subsea cable network. With this next-generation cable landing station design, the cables extend directly to an Equinix IBX data center. That means any user of a subsea cable system that lands inside one of our Equinix global data center termination points has instant, low-latency access to a host of vibrant industry ecosystems inside Equinix, and that's a huge advantage," stated Jim Poole, Vice President, Business Development, Equinix. 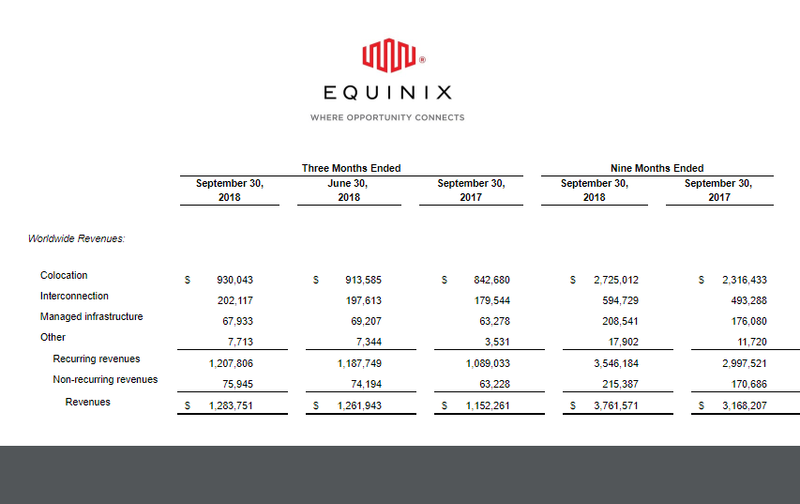 Equinix's quarterly revenues increased 28% year-over-year to $1.216 billion; a 10% year-over-year increase on a normalized and constant currency basis. Peter Van Camp, Executive Chairman and Interim CEO and President, Equinix, stated: "As Equinix approaches its 20th anniversary, we are excited to post our 61st quarter of consecutive revenue growth, which is reflective of the critical role we serve in helping businesses interconnect their IT infrastructure to succeed in the digital economy. Equinix currently serves nearly half of the Fortune 500 and our recent acquisitions, combined with our currently announced organic expansions, have positioned Equinix to capture an even greater share of the market opportunity." Equinix completed its previously announced acquisition of Metronode, an Australian data center operator, for A$1.035 billion (US$792 million) in cash. Metronode was owned by the Ontario Teachers’ Pension Plan since December 2016. Metronode operates two data centers in Melbourne, three in greater Sydney (including one in Illawarra), two in Perth, and one in each of Canberra, Adelaide and Brisbane. The acquired Metronode sites add approximately 20,000 square meters of gross colocation space to the Equinix footprint. Metronode also brings more than 80,000 square meters of land, 90 percent of which is owned. In Melbourne and in Sydney, the Metronode data centers will provide a diverse, second campus for Equinix's existing properties. Both of these Metronode campuses are described as "hyperscale ready". In Perth, Metronode's data center will house the landing station for the new Vocus Australia Singapore Cable. Equinix's existing data center in Sydney also houses the landing station for subsea cables. Metronode generated approximately A$60 million, or approximately US$46 million, of revenues in the 12 months ending September 30, 2017, with a margin profile accretive to the Equinix Asia-Pacific business. The Equinix footprint in the Asia-Pacific region now includes 40 data centers and extends the company's global footprint to 200 data centers across 52 markets. Dropbox is expanding its global private network by offering its global collaboration platform on the Equinix Cloud Exchange Fabric. Dropbox is also launching six new points of presence across North America and Europe that will improve performance and reliability for users globally. The new PoPs will include Atlanta, Denver, Berlin, Toronto, Stockholm, and Oslo.By the end of the year, the company plans to have an infrastructure footprint that spans 29 facilities in 12 countries on four continents including North America, Europe, Asia and Australia.